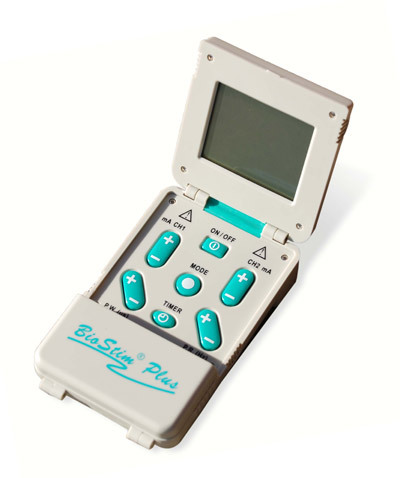 An upgraded version of the BioStim LX TENS, this unit offers the latest technology in electro-therapy. Features user friendly programmable functions with a larger 2" x 2" LED digital display screen and keypad. Offers 4 pre-programmed and programmable modes of treatment: continuous, width modulation, burst mode and cycled burst, each with timer control. Pulse width and frequency values, intensity levels (for each channel), treatment mode, and timer are all displayed on the screen. This unit also features a Patient Lock (which prevents patients from changing the parameters set by the practitioner) and Compliance Meter (which shows the usage time per patient). Includes self adhesive electrodes with wires, carrying case, two AA 1.5 vo99t batteries, belt clip, and instructions.